Home » cricket news » Rohit Sharma took a pic of his wife Ritika secretely; her reaction after seeing it will amuse you! Rohit Sharma took a pic of his wife Ritika secretely; her reaction after seeing it will amuse you! Cricketers love story always attract their fans and wanted to know about their relationship with their girlfriends or wife. Recently, many cricketers got tied in nuptial knots like Virat Kohli, Zaheer Khan, Bhuvneshwar Kumar and many more to join this marriage league. There are many famous couples from Cricket world whose love story can’t be hidden from us. As we know about MS Dhoni love for his wife Sakshi, Virat love for Anushka. 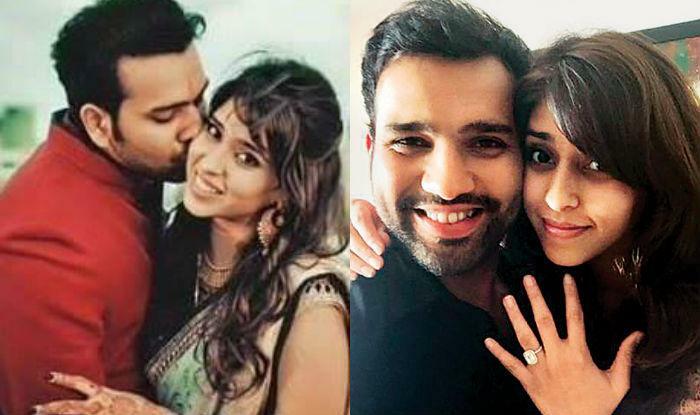 Today, we are going to tell you about Rohit Sharma and his wife Ritika Sajdeh. Indeed, they made a cute couple and also, seems to be very active on social media as well. We have found several times that how the duo expresses love for each other. Whenever Rohit gets free time from his matches then he always spends his free time with his wife. The lovebirds not only go on holidays but also enjoy for their moments of togetherness. Even they shared their good memories on social media as well that we can’t miss out on. Recently, a conversation between Rohit and Ritika is doing the round on social media. These days Rohit seems to be free as he is not going to play the Test Series against England which would start from 1st August. Therefore, Rohit has decided to go on a trip with his wife and during that he has taken a secret picture of his wife Ritika while doing some work on her laptop and also teased her. We must say that their love chemistry is really amazing. What do you think about this cute conversation?